It's both a good thing and a sad thing that I went into the movie Spotlight not knowing all that much about the molestation scandal that rocked the Catholic community in Boston — and the entire country — in 2002. Good because the shocking truths that are slowly and painfully revealed throughout the course of the movie make for some pretty suspenseful viewing. Sad because Jesus Christ everyone should know about this! Hopefully this movie will make sure that happens. Comparisons to All the Presidents Men are easy but accurate to make: they both present journalism as exciting, important, and riveting stuff. Michael Keaton heads the cast as Walter "Robby" Robinson, lead editor of the Spotlight team at the Boston Globe, a team of investigative journalists that are able to work separately from the daily reporters, following stories for as long as it takes to get them told right. When Marty Baron (Liev Schreiber) takes over as the Globe's Editor-in-Chief, he decides to dig deeper in a story about molestation by local Catholic priests, and puts Spotlight on the story. Mark Ruffalo, Rachel McAdams, and Brian d'Arcy James are solid as the other Spotlight reporters, and their investigation uncovers years and years of abuse and cover-ups within the Catholic Church, as well as a devastating number of abusers and victims. For the most part, the reporters' private lives are left out of the story, and what we see is the team doing their jobs, something that certainly doesn't sound movie-worthy, but most definitely is. The cast is also, for the most part, delightfully subdued, with only Mark Ruffalo having a scene that's just a little too "For Your Consideration." As I've previously noted, if the cast is large and full of well-known names, you can be pretty sure the movie will be terrible. Love the Coopers proves that point once again. If you think this looks like an uplifting Christmas story about the love of family, think again. Sure, it wants to be, but instead it's a depressing mess. And I'm not talking depressing in the way say, It's a Wonderful Life is a depressing Christmas movie that makes you cry but also feel good about humanity. Love the Coopers is about as enjoyable as one would imagine spending the holidays with a highly dysfunctional family would be. And that huge cast is just all wrong! Diane Keaton and John Goodman play mom and dad Cooper. I was wondering why the camera seemed to be smeared with Vaseline every time they were on screen, then saw who was cast as their siblings and grandparents and understood; they're suppose to be playing a lot younger than they actually are. Keaton is 69. Alan Arkin, who is 81, plays her father. Marissa Tomei plays her younger sister, and we're talking younger by like six years, not the actual, real-life, 20 year difference between them. Finally, Ed Helms plays their son, who became a father during high school, but whose oldest child is only about 15 and WHAT?! The movie does have its one bright spot, and that's the romantic storyline centered on the Cooper daughter, played by Olivia Wilde, and a newly enlisted solider, (Jake Lacy) she recruits to be her pretend-boyfriend. They'e the source of the film's only real laughs and heart-tugs. Antonio Banderas stars in this fact-based drama about the 33 who men who were trapped in a Chilean mine for 69 days in 2010. Also starring Lou Diamond Phillips, James Brolin, and Juliette Binoche. Includes one of the last scores by composer James Horner, who died earlier this summer. Nineteen-fifties Brooklyn is the setting of this drama starring Saoirse Ronan as an Irish immigrant who moves to the New York, finds love, but then must choose between her new life, and her home back in Ireland. Nick Hornby co-wrote the screenplay, based on the book of the same name by author Colm Tóibín. 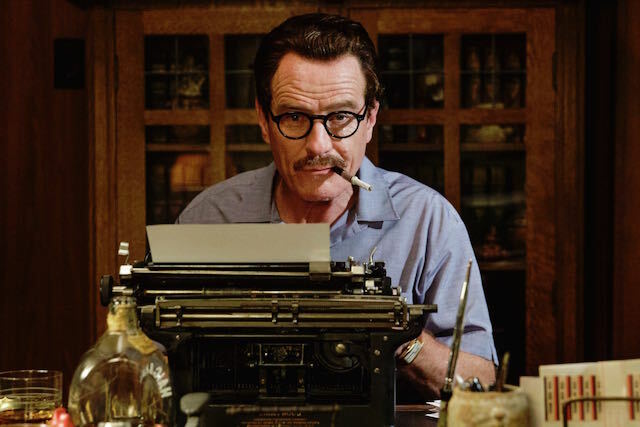 Bryan Cranston stars in this biopic about Dalton Trumbo, the 1940's screenwriter who refused to testify before the congressional House Un-American Activities Committee, was deemed a Communist, and was then blacklisted in Hollywood. He continued to write stupendous films (including Roman Holiday) that won Oscars, all while using a pseudonym. Sounds like Angelina Jolie, director, has found her filmmaking niche: really slow and boring movies! In this one she directs herself and husband, Brad Pitt, in a story about a couple in the 1970's who take a trip to the south of France to try and fix their troubled marriage. Because that worked so well for Scott and Zelda! Friday Morning Constitutional: Makeover For Union Square Macy's? Jay says that If/Then is "so original in its form and passionate in its execution that one forgives its fundamental flaws." [SFist] The Macy's in Union Square might get a major revamp.